Quick unit converter is a simple, fast and accurate unit / metric conversion app that allows you to perform your desired conversion as quickly as possible. Conversion results appear instantly while entering the input data. No Internet connection is required to use Quick Unit Converter (only currency converter will need the internet connection to get latest currency rates). 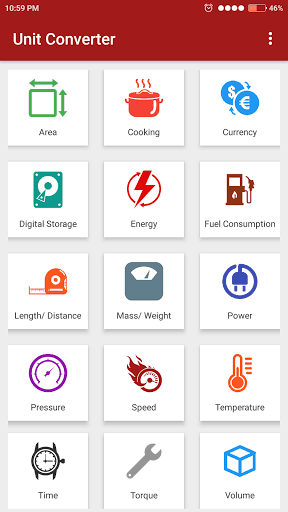 A perfect unit converter app that can be used for work, school, office, kitchen or in daily life. 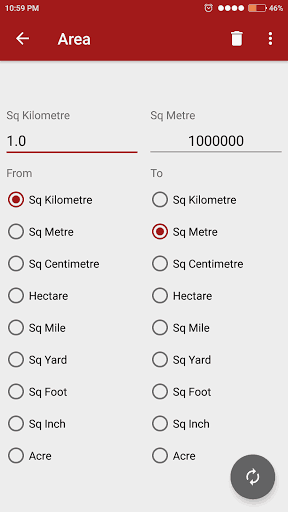 Area : Square Kilometre, Metres, Centimetres, Hectare, Mile, Yard, Foot, Inch, Acre. Cooking : Teaspoon, Tablespoon, Cup, Pint, Quart, Ounce, Gallon, Millilitre, Litre. Currency : USD, AUD, GBP, BRL, BGN, CDN, CNY, HRK, CZK, DKK, EUR, HKD, HUF, INR,IDR, ILS, JPY, KRW, MYR, MXN, NZD, NOK, PHP, PLN, RON, RUB, SGD, ZAR, SEK, CHF, THB, LIRA. Digital Storage : Bit, Byte, Kilobyte, Megabit, Megabyte, Gigabit, Gigabyte, Terabit, Terabyte. Energy : Joule, Kilojoule, Kilocalorie, Calorie, BTU, Ft-lbf, In-lbf, Kilowatt-hour. Fuel Consumption : Miles/gallon, Liter/100km, Kilometre/litre, Miles/liter. Length : Kilometre, Miles, Meter, Centimetre, Millimetre, Micrometre, Nanometre ,yard, Feet, Inch, Nautical Mile, Furlong, Light Year. Mass/Weight : Kilogram, Pound, Gram, Milligram, Ounce, Grain, Stone, Ton. Power : Watt, Kilowatt, Megawatt, Horsepower, Calorie Per Second, BTU Per Second. Pressure : Megapascal, Kilopascal, Pascal, Bar, PSI, Psf, Atmosphere, Technical Atmosphere. Speed : Km/h, Mph, Knot, Foot/second, Metre/second. Temperature : Celsius, Fahrenheit, Kelvin, Rankine, Delisle, Newton, Reaumur, Romer, Gas Mark. Time : Year, Month, Week, Day, Hour, Minute, Second, Millisecond, Nanoseconds. 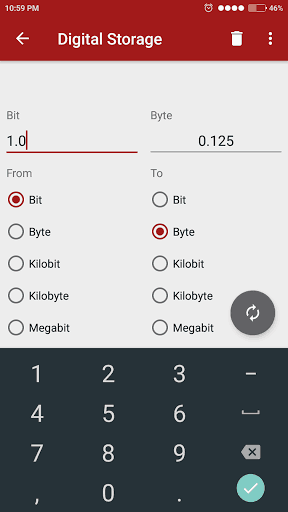 Based on Phil Shadlyn's open source unit converter app.